The Tsingy of Bemaraha Integral Natural Reserve is a western region of Madagascar listed since 1990 as a UNESCO World Heritage Site. 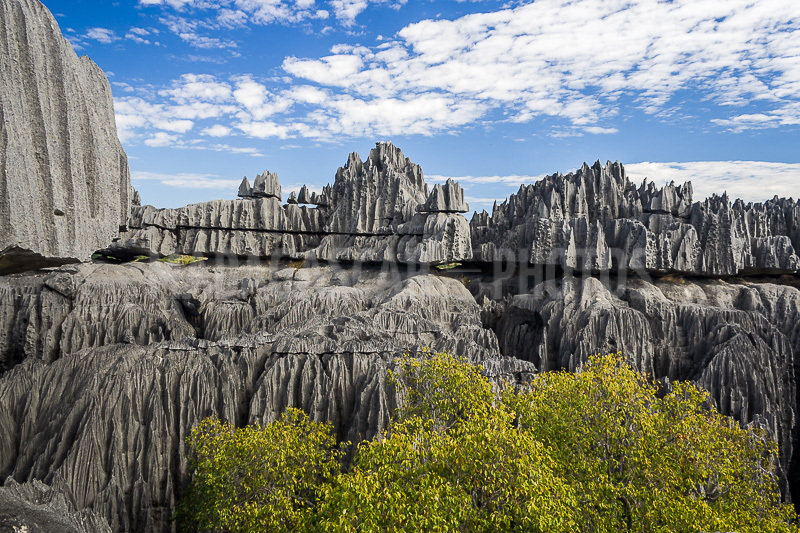 It lies north of Tsingy of Bemaraha National Park. The reserve covers an area of 582 square miles at an altitude of between 500 and 2300 feets. A karst landscape and a limestone massif sharply shredded form a "tsingy" or "forest" of calcareous spurs, landscape unique in the world. The reserve is home to other karstic events such as the gorge of the river Manambolo (1000 to 1300 feet deep). The Bemaraha Reserve also has a contrasting landscape with hilly relief and high peaks where primary forests, lakes and mangroves provide habitat for various species of rare birds and lemurs. The Tsingy appear as true cathedrals of limestone, made up of a very dense network of faults, crevasses, surfaces of limestone blocks carved in blades or sharp needles. Formed by a deposit of fossils and shells dead under the sea 200 million years ago, and subsequently shaped by rain water 5 million years ago, the tsingy offer one of the landscapes the most spectacular of Madagascar. 300 years ago, the Tsingy served as shelter for the "vazimba", the first occupants of Madagascar, who for their cutting aspect would have given them the name of "Mitsingitsingina", "where one walks on tiptoe". Today they are a place of worship and ceremony for the local people.